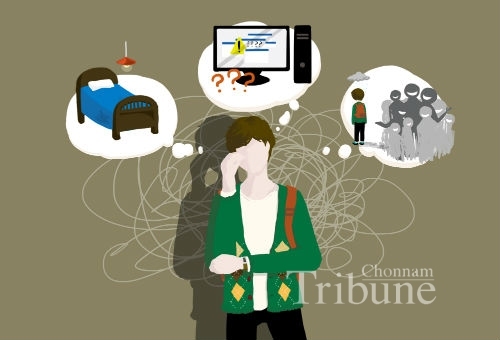 ▲ Domestic exchange students face some problems before transferring to other schools. Students who want to study in another city can do so through a domestic credit exchange program (DCEP) and so they challenge themselves and gain their further experience during their undergraduate years. Chonnam National University (CNU) has signed credit exchange agreements with 37 colleges and has dispatched around 100 students every year. However, according to these students, there seems to be several problems such as administrative and psychological inconveniences that students suffer from their new circumstances. In order to improve the DCEP experience, these students need advice and help. CNU introduced the DCE program as “academic opportunity to enhance their learning within the classroom and even experience cultural differences or trends.” The DCE, also called a credit transfer, is a program where students study one or two semesters at other universities that have signed a credit exchange agreement with CNU. As this exchange with other universities is actively under way, more and more students are participating in the program year after year. However, domestic exchange students face many problems before transferring to other schools. Most of them start their semester at the new school without orientation. Students have many questions about their upcoming campus life but get their information only through the websites that often cannot provide proper answers. Many students complained that they had no one to ask, or nowhere to go to find information. Kim Min-ji (Senior, Dept. 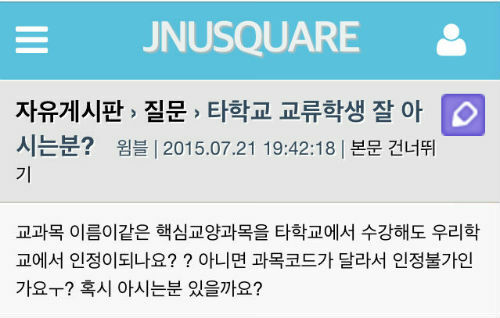 of Psychology), who spent a semester at Korea University last year, had trouble getting the information. She said, “There were no specific guidelines for the exchange students. I do not know well how to register for the courses, programs that I can participate in, and to build a social network.” Difficulties students face during the semester are taken care by oneself as well. Another important matter for the exchange students is residence. CNU exchange students who study at universities in Youngnam district are provided a room at the dormitories. However, schools in Seoul do not provide a space for students from other cities. Application for the student dormitory is opened to everyone, except the period of applying for the exchange program and registering for the student dormitory overlaps with that of local students and this procedure is not well known to exchange students. It means that students from other universities cannot guarantee a living place in dorm. 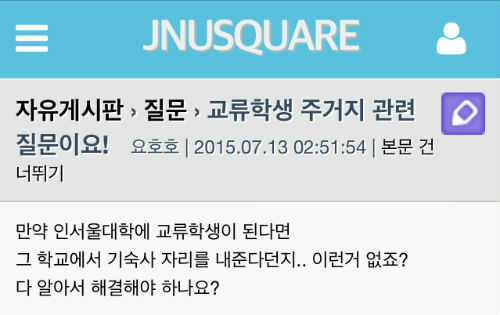 A student who is planning to go for an exchange student to University of Seoul next semester said, “I thought I would absolutely get a room in dormitory but I realized recently that I won’t. I have applied for a room but might have to get another room as soon as possible.” Even until few weeks before the semester, still she does not know whether she will need to get another room near the school or not. As stated by Administrator of University of Seoul, “This is because during the exchange period, exchange students are regarded the same with the students who are in our school. Therefore, we cannot favor exchange students.” Among five schools in Seoul having an exchange agreement with CNU not a single school offers a room in dorm preferentially. This issue has been questioned for several years but still has been pointed out as a significant problem. An exciting campus life was expected in a new situation with new people. In terms of that, while some exchange students have no difficulties associating with new friends, most of the students claim that there is not enough chance to get along with other students. Usually, exchange students hang out together themselves. However, even this case is when more than two people applied for the same school. Being alone in unfamiliar condition, managing everything by oneself leaves a person stressed and depressed. What is funny is that schools do not respect exchange students through the DCE program in this part. Most universities assign a student counselor for their students, while none of exchange students from other schools is allotted. As a member of the school, each exchange student deserves proper support and information. Universities need to be somehow flexible dealing with such problems and be more concern about exchange students, who have chosen the school to learn more. Like a buddy program for international students at CNU, partner universities need to introduce a program that keeps domestic exchange students connected and tied with other students. Every year after the semester, same problems repeatedly arise: especially, those dealing with student residence and the lack of information. Both of these are bread-and-butter issues among DCEP students. We need to care deeply about their discomforts and establish better environment for students who are starting their campus life outside of our school. There are lots of programs for international students but why not look more closely into our domestic university students? It is time to turn our eyes away from just the international issue. In order to leave the short campus life with pleasant memories, the support of existing systems at CNU is necessary. In order to guide and control the students, a methodized system and a counselor are required. Orientation before the semester will be beneficial for the students to get information. Connecting students in a group will be helpful to allow them to socialize. After exchange students come back, the Office of Academic Affairs (OAA) needs to let them give in a report covering their exchange period and to conduct a survey asking their satisfaction. By reflecting the feedback on the DCEP operation and hearing the voices of students, it is time to seek out solutions for the problems. Choi Young-tae, a head of the OAA, says “National level of support is needed to encourage more students to participate and to enhance the program.” More than good intentions must exist. Don’t let the good intentions go bad. Both students and schools will have to put more effort to make the program better.